This used to be one of three go-to recipes I relied on. (The other two: pumpkin bread and chocolate chip oatmeal cookies, the latter from a family recipe.) 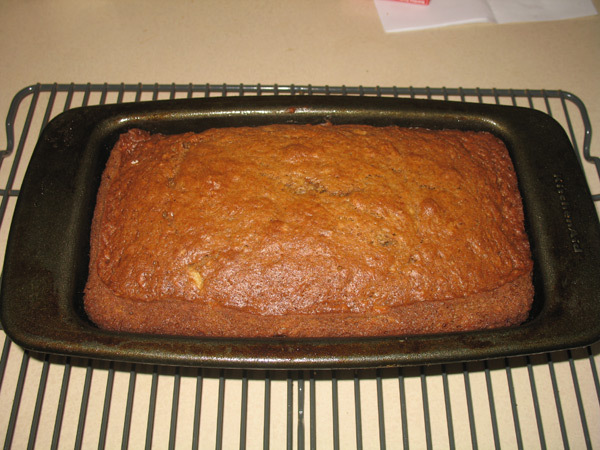 I tried to lighten this banana bread up a little, and I think I could do more with it, but I wanted the changes to be subtle rather than dramatic. I had a bad experience a while back trying to substitute applesauce for most of the butter, but it ruined the texture, making it overly moist to the point of not feeling properly cooked through. I did not want to repeat that mistake. The original ORIGINAL recipe called for butter, but I changed it to oil a long time ago, and this time I took things a step further. 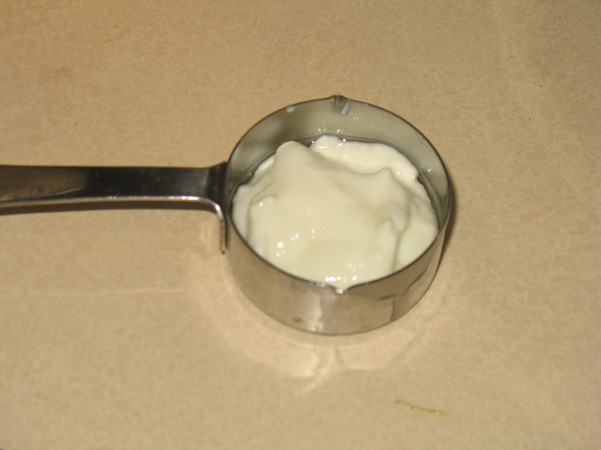 I put in 1/4 cup of canola oil and 1/8 cup of plain low fat yogurt. I don’t have a measuring cup that size, so I just filled a 1/4 cup half way and hoped for the best. I added in the eggs, beating after each one. I put that aside, and got a small bowl. 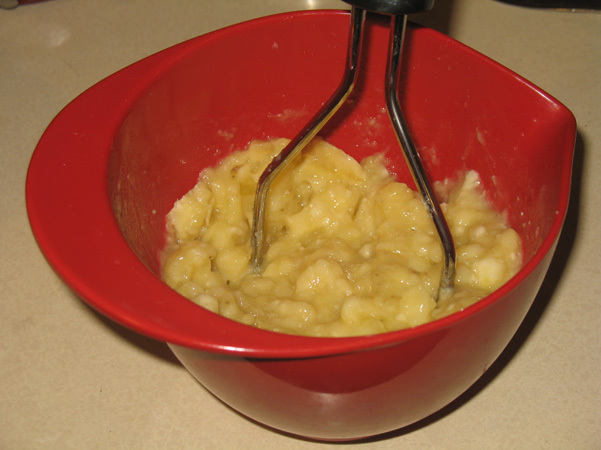 I mashed up four bananas, using the potato masher to get it as smooshy as possible. 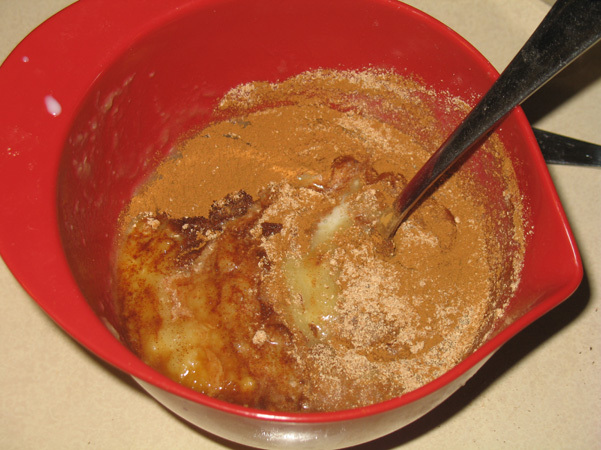 Once they were mashed up nicely, I added the milk, cinnamon, nutmeg, and vanilla. Then I set THAT aside, and got out the dry ingredients. I don’t think I even knew what whole wheat white flour WAS when I used to make this, but now it’s just automatic. I added baking soda & baking powder, but balked at the idea of a full teaspoon of salt, and cut it back to half a teaspoon. Then I set up the three bowls next to each other, just to see where I stood. I poured the banana mixture into the bowl with the oil/yogurt base. Yeah, I know it looks a little…well…barfy. But it smelled like bananas and spices and didn’t worry me a bit. 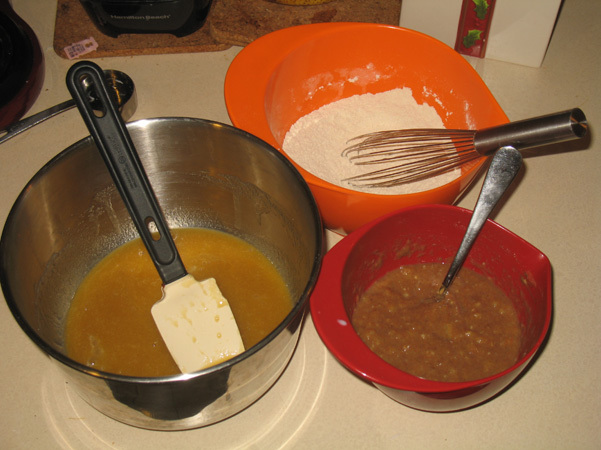 I stirred that up, then added in the dry ingredients, mixing only until the last traces of flour were no longer visible. At this point you could really get creative. Nuts would be nice, or peanut butter chips (which I’ve done, and it turns out great), chocolate chips, or cinnamon chips would all work too. But since I was messing with the recipe already, I thought it best to keep things simple this time. Plus it’s not particularly Weight Watchers-friendly, although it’s not particularly unhealthy, and I know I’m going to need to sample this to know if I did a good job. I poured it into the loaf pan. Just under an hour later, it was done. It smells great, it looks great, but I won’t know until tomorrow how it tastes. I did promise Nathaniel his chocolate drizzle, so I certainly can’t cut it open tonight! I’m very curious to see if my acquired baking knowledge makes this recipe better, or worse. 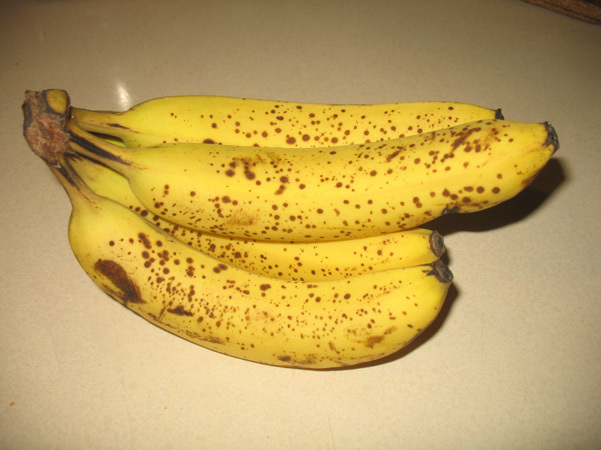 It is a keeper, mostly because of the moist but fluffy texture and the strong banana flavor, so it may just be perfect as is. Oh, and why does Nathaniel deserve whatever baked goods he sweetly asks for? Just look at him. 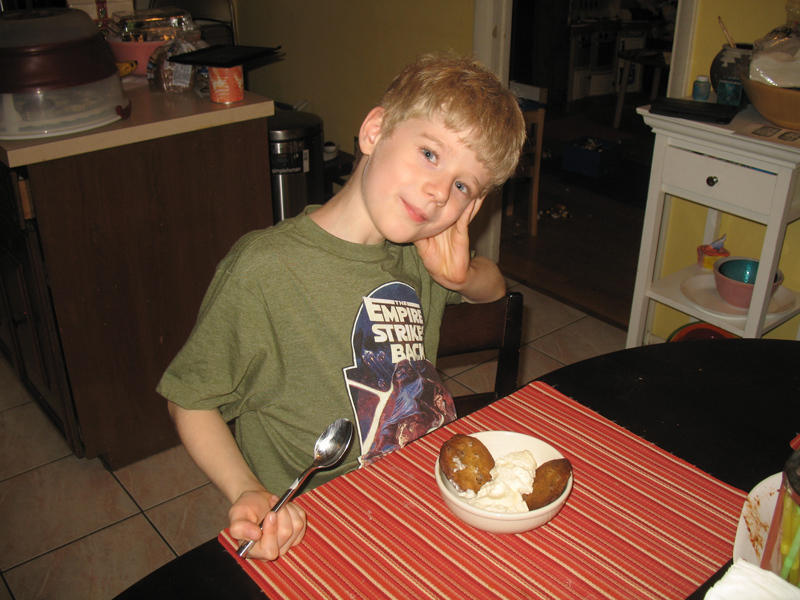 He’s eating Malted Milk Chocolate Chip Cookies with vanilla ice cream, a special treat to cap off the day. He’s just so delightful to be around. And here’s his crazy sister. She is a wild woman! 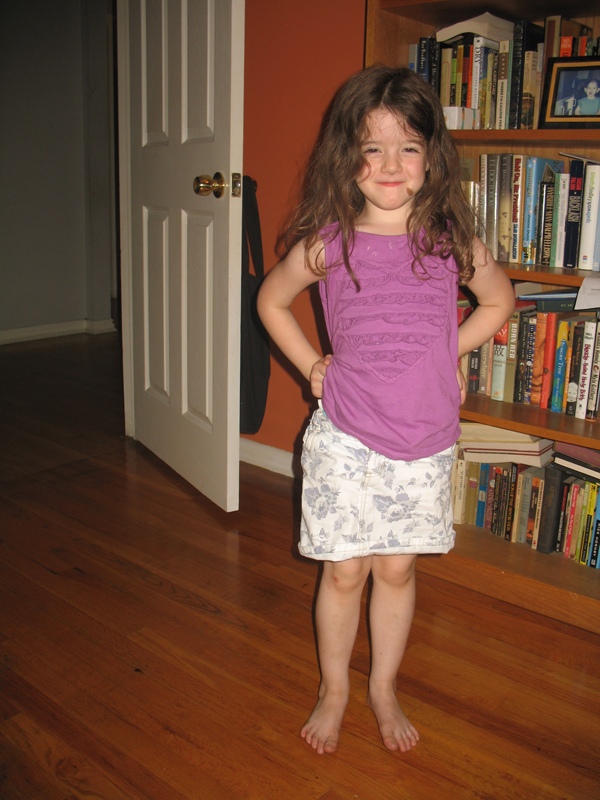 And hilarious and just oozing with personality — relentlessly, with the energy only an almost 5-year-old has. I will come back and post the results on the banana bread. For now, it waits. Update: I finally tasted it today. Perfect! Soft texture, strong flavor without too much sweetness, and better than it used to be. Success! So happy about this! I plan to play with it even more the next time and see if I can get rid of the oil entirely. 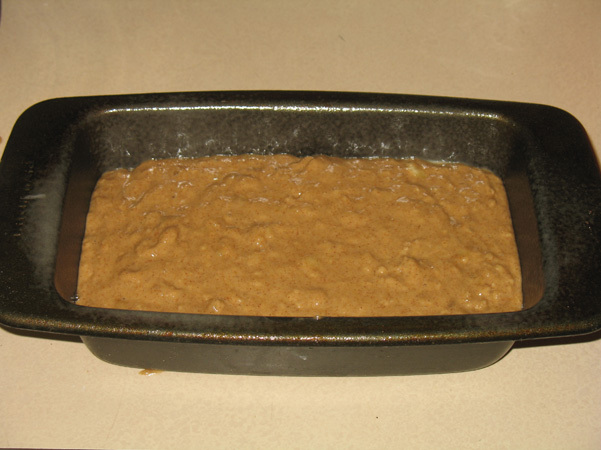 Preheat the oven to 325 degrees F. Grease a 9 x 5 inch loaf pan, using butter or cooking spray. 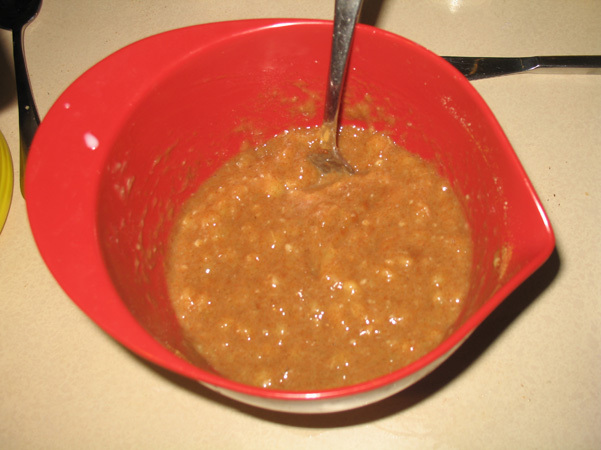 Combine the sugar and yogurt in a large mixing bowl. Add the eggs one at a time, beating well after each one. In a small bowl, mash the bananas. 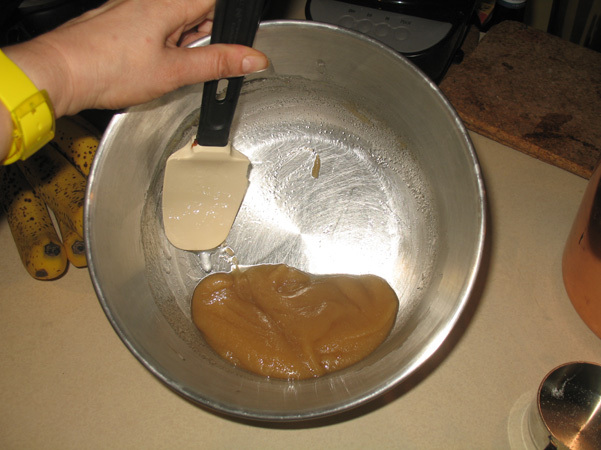 (Using a potato masher for a smoother mixture, a fork for a more chunky one.) Mix in the milk, cinnamon, nutmeg, and vanilla. 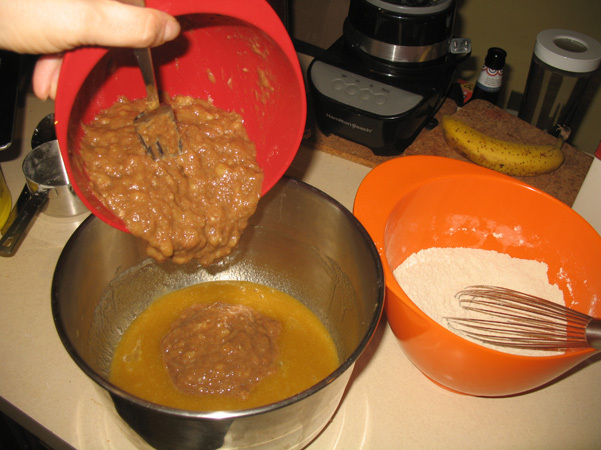 In another bowl, whisk together the flour, baking powder, baking soda, and salt. 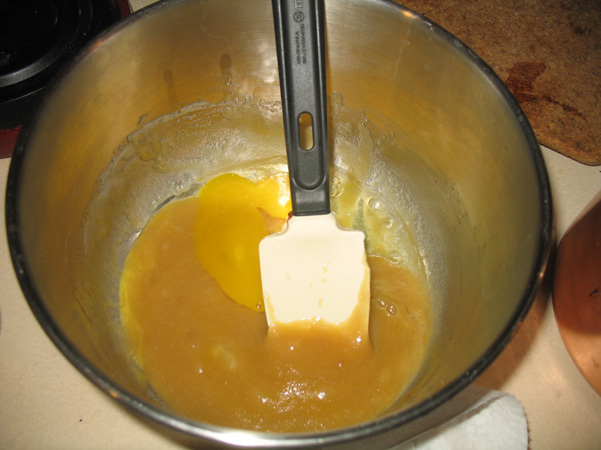 Add the banana mixture to the creamed mixture and stir until combined. Add the dry ingredients, mixing just until the flour disappears. Pour batter into prepared pan and bake for almost an hour, until a toothpick inserted in the center comes out clean. (Every oven is different so I’d start checking at 50 minutes.) Cool in the pan on a rack for 15 minutes, then remove bread from the pan and cool completely before adding any (optional) topping. 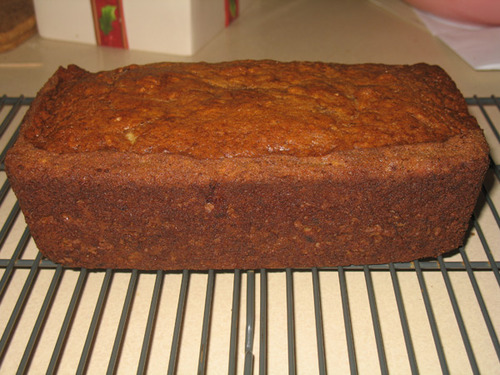 While this banana bread is delicious as is, it’s also fun to add some decadence. Peanut butter chips are a great addition, especially with a bit of chocolate drizzle on top. If you increase the yogurt slightly, you can add a quarter cup of cocoa powder. Cinnamon chips would be nice too.